As I am getting more requests to supply little shops and boutiques with my Angels I thought it only right that I should share some information to make it easier for you to decide if my work fits with your needs. Wholesale prices are only given to those with a shop front from which to sell my Angels. They are beautiful to look at and photographs never do them justice hence they need a little space of their own from which they can shine. I am happy to supply larger paintings too and these will be painted upon completion of payment, delivered by courier and supplied with Certificates, Angel information etc. 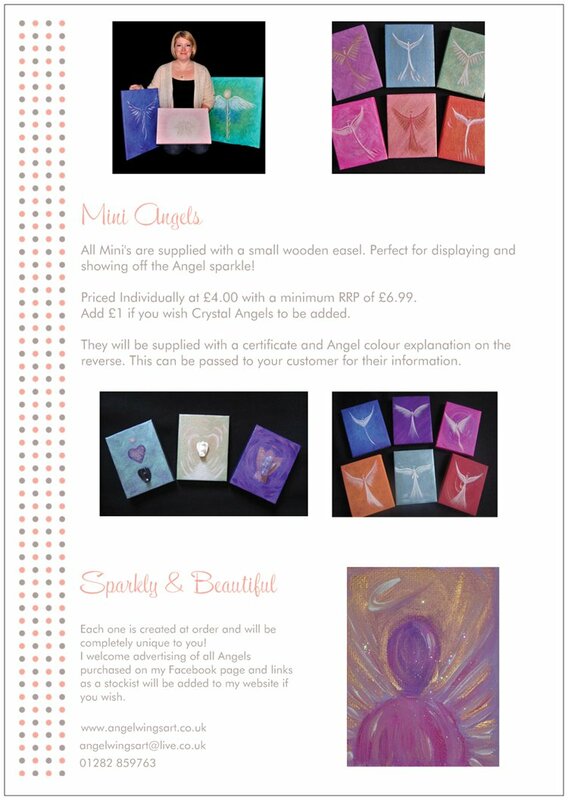 All Angel paintings including Minis are created just for you so no two are alike. My Angels are very important to me, as is customer care so I always provide plenty of information and photographs before Angels are sent. Quantity is entirely up to you as I don't have a set unit amount. This way you can try as little as two or three items to see if they feel right for your shop and/or displays. If you would like a sample greetings card then I can provide one completely free of charge. Payment is required before all stock is sent out; either by Paypal Invoice, BACS or Cheque. Postage will be added to all orders and displayed clearly on the invoice. I hope this information helps a little and answers a few questions. My Angels and I look forward to hearing from you to see if we can work in partnership to share the love of the Angels.